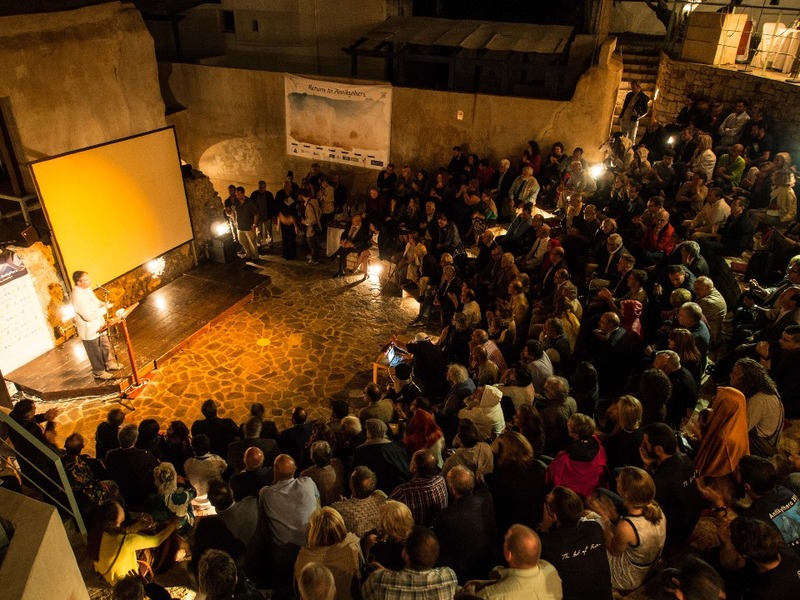 Will technological advances lead to more discoveries? It's every archaeologist's dream adventure. In 1901, the "Antikythera" treasure was discovered in Greek waters, where the remains of what is probably the oldest "astronomical calculator" in the world were uncovered. 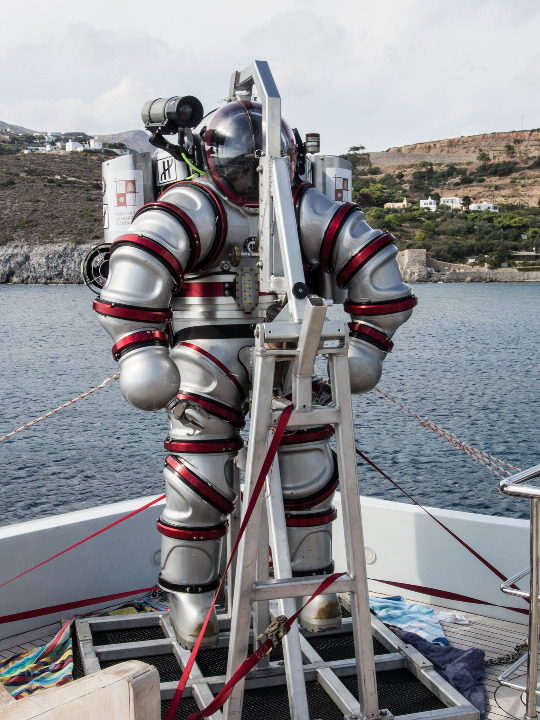 Today, a scientific expedition led by Brendan Foley (diver and archaeologist) is returning to the Antikythera site off the coast of Kythera to carry out a second historic dig, this time equipped with a latest generation dive suit designed for extremes: The EXOSUIT, which is sporting Hublot colours for this special event. 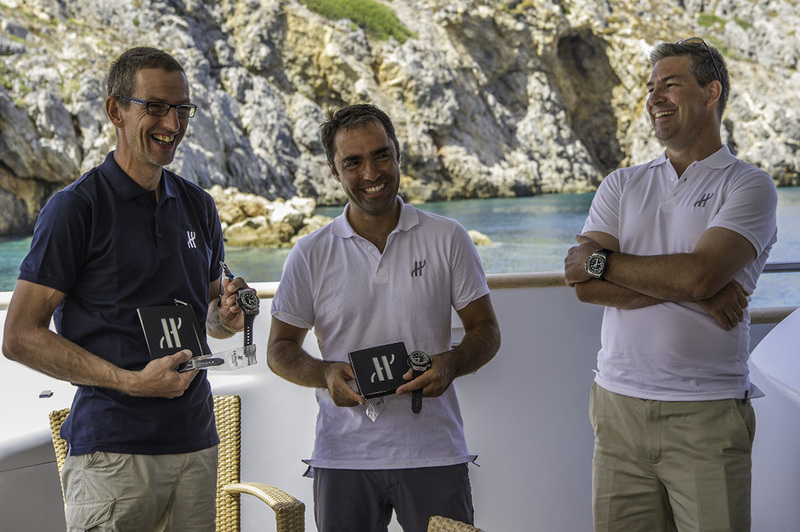 To support and mark this occasion, Mathias Buttet, Hublot R&D Director attended the dives, and presented the OCEANOGRAPHIC EXO4000 dive watch, also designed for extremes, and which pays tribute to the scientists involved in this incredible adventure. The Antikythera mechanism is one of the most mysterious objects in the history of civilisation. Nowadays it is renowned and studied in great detail by the scientific community, but when it was first discovered back in 1901, its great historical and technical value remained a mystery to be uncovered. The very idea of a "machine" created in Greco-Roman Antiquity did not enter the conceptual framework of the specialists of the time. Thereafter, obscurantist statements from non-scientists claimed that the artefact from Antikythera was almost extraterrestrial in nature, which only served to muddy the waters. 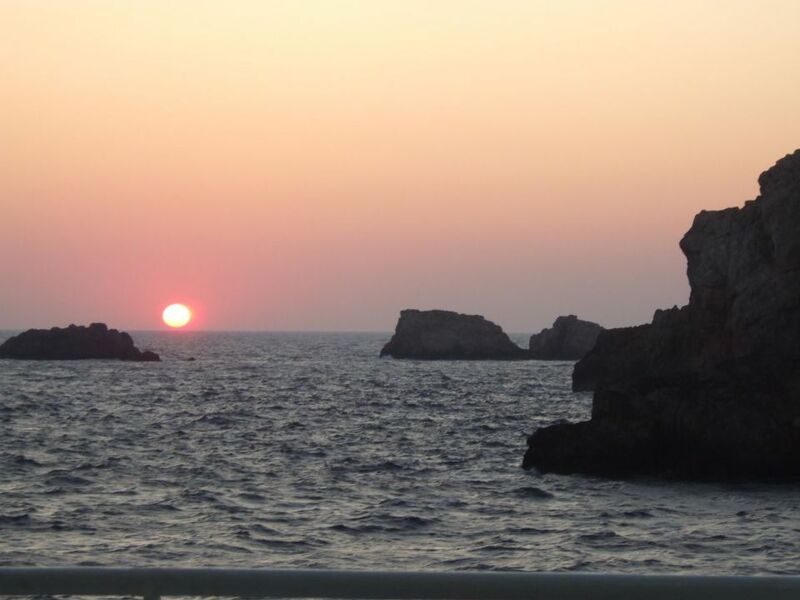 Today, the site beneath the waters off the coast of the Greek island of Antikythera, where the remains of what is considered to be the oldest "astronomical calculator" in the history of humanity were discovered, is the subject of a second underwater archaeological expedition. Like a spacesuit or a futuristic aqualung... 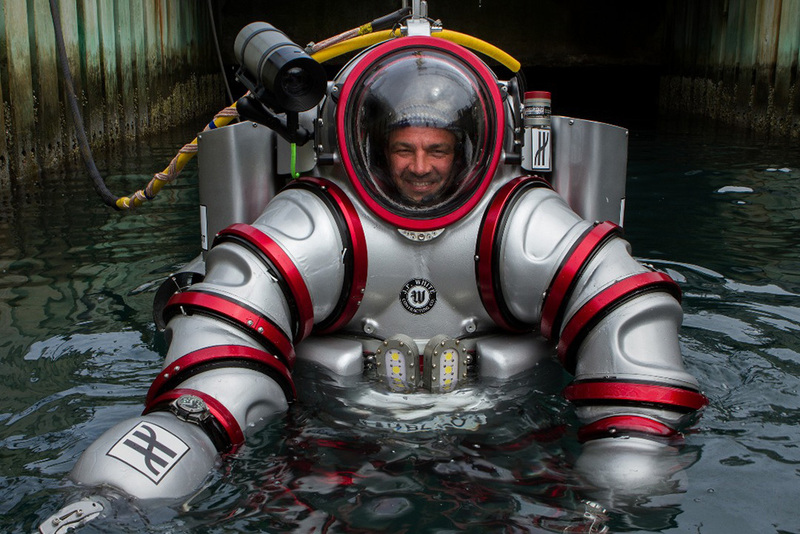 Led by the diver and archaeologist Brendan Foley, this expedition boasts a very valuable asset: a cutting-edge dive suit, akin to a "submarine suit of armour", developed in the US, which allows diver-archaeologists to combine the flexibility of a dive suit with the resilience of a submersible. 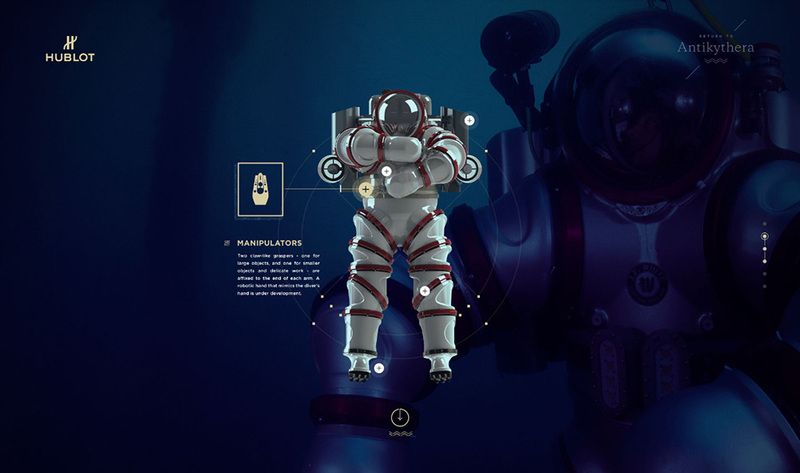 Known as the EXOSUIT, it can be used to depths of 1000 feet (300 metres). 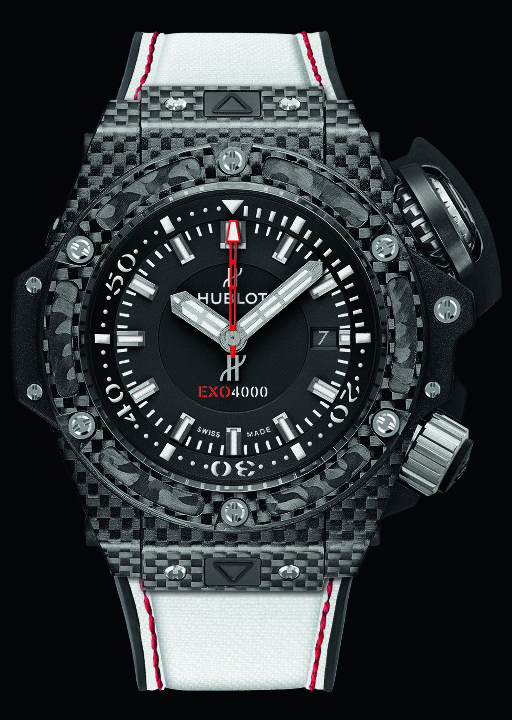 It sports the Hublot colours, in recognition of the brand's support for the expedition. 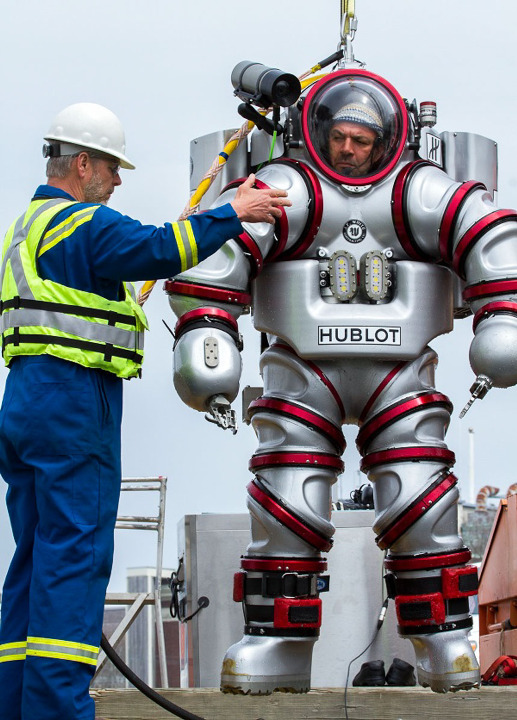 Two metres in length, weighing 240 kilos and made entirely from aluminium alloy, the diving suit has water thrusters and 18 rotating joints, which make it relatively flexible. This allows it to combine mobility and resilience at depth. Carbon dioxide is chemically removed and oxygen supplied according to the diver's metabolism "at both working and resting rates". With a maximum autonomy of 50 hours, it hugely expands the possibilities for exploration. With the atmosphere kept at normal pressure, the diver does not have to work with complex combinations of gases, as found in diving cylinders. 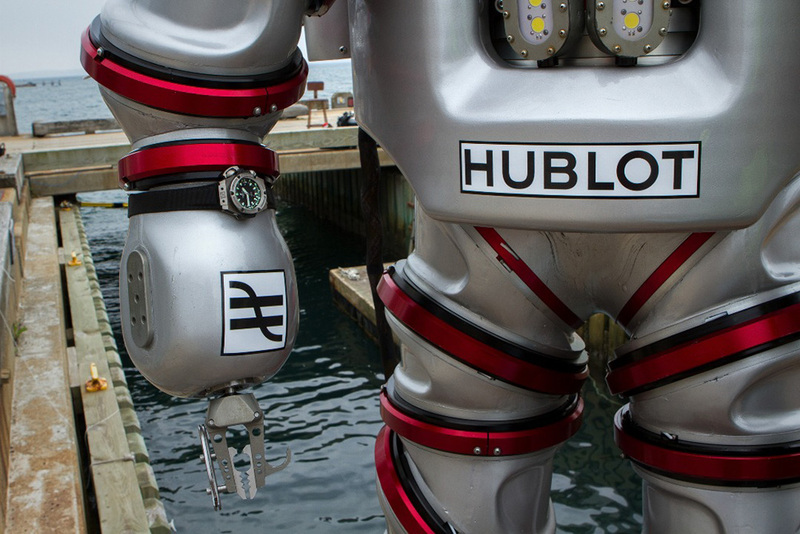 Due to its advanced technology, this equipment carries a price tag of $1.3 million. At this time, just one EXOSUIT has been manufactured for the company J.F. 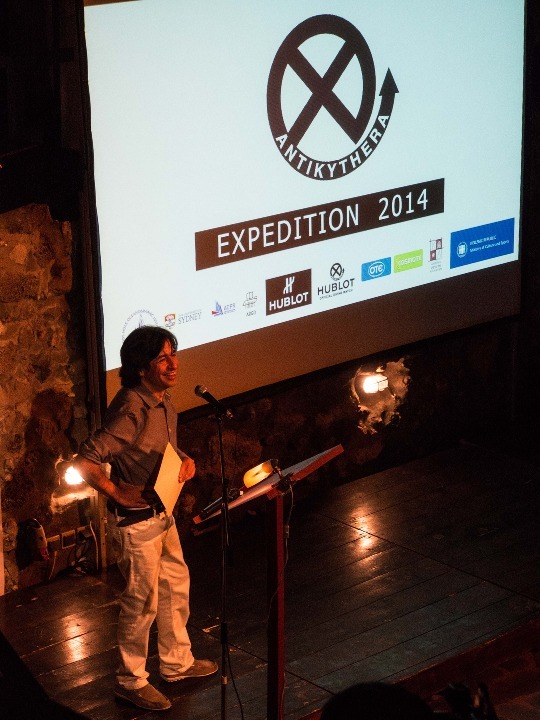 WHITE, who kindly allowed the equipment to be used for the "Return to Antikythera" expedition. A second suit, also for J.F. WHITE, is currently being produced. 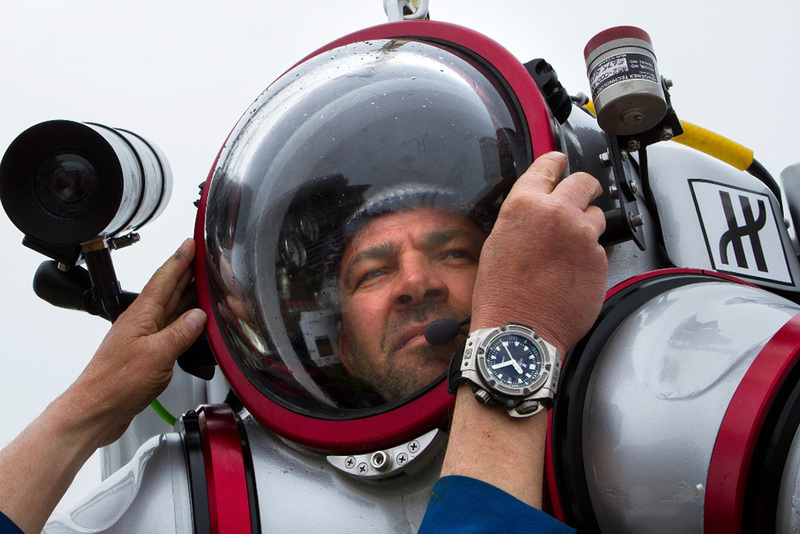 The OCEANOGRAPHIC EXO4000 dive watch, able to withstand the pressure at depths of 4000 metres, is a tribute to the work of the entire team of scientists behind this incredible adventure. Whilst space missions are aimed at discovering far-away environments, there is one part of our planet that we know very little about: the ocean floor. To enable explorations at ever-greater depths, engineers, inventors and technicians work tirelessly to keep pushing the boundaries of the rational and the possible. 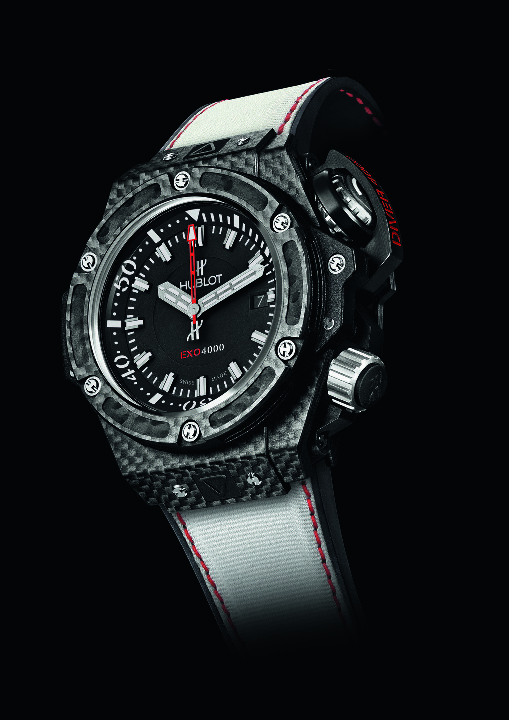 Hublot has also pushed boundaries to create a watch which is resistant to extreme pressure, as found at 4000 metres. It is a genuine instrument, equipped with the most highly-developed technology, ergonomics for efficiency and ease of handling. 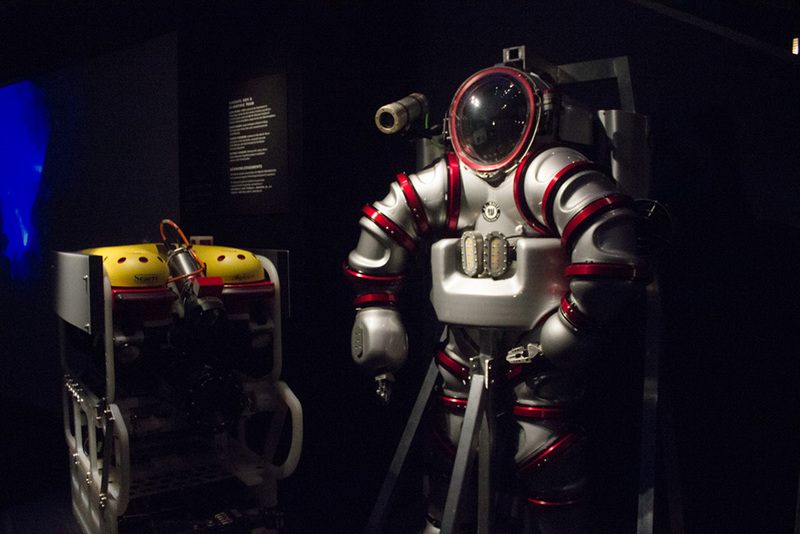 It took 18 months of research, development and tests throughout 2010 and 2011 before the first Oceanographic 4000 was unveiled at the Monaco Oceanographic Museum. 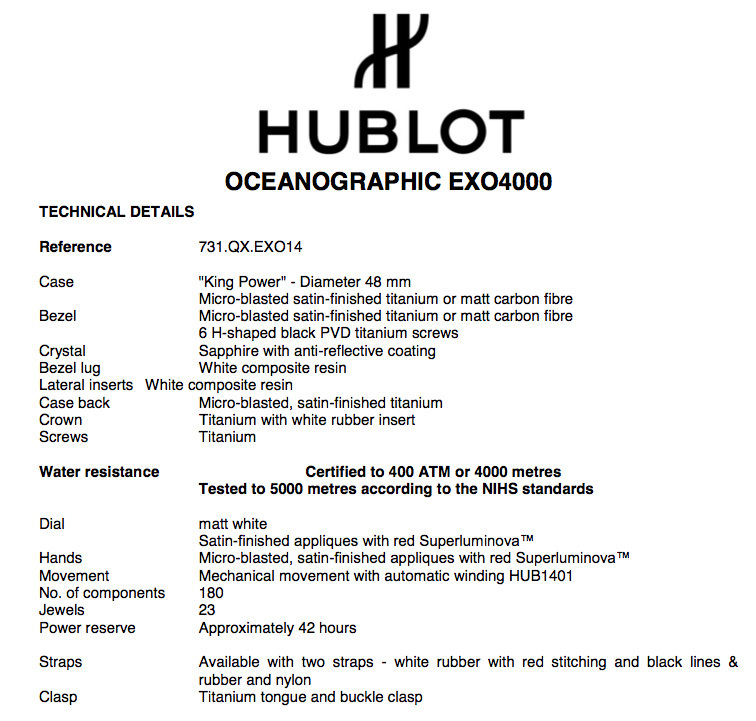 Almost all the features of the Oceanographic EXO4000 are exceptional, in terms of design, development and manufacturing. To be described as a "dive watch", resistant to the pressure exerted at the record depth of 4000 metres, the watch had to meet the exacting specifications of the international standards of Swiss watchmaking (NIHS). Starting with its water resistance, tested in the Hublot manufacture in a Roxer tank, submerged and pressurised to the equivalent of 5000 metres. To ensure the watch is water resistant and can withstand this pressure, the synthetic sapphire crystal is 6.5 mm thick. This is thicker than normal, but is reasonable for this level of resistance. The case back is screw-down, essential for reaching such depths. It is made of grade 2 titanium, an extremely strong stainless material. As its case is made of titanium, a material prized for its extreme lightness and with technical features appropriate for the specifications, the OCEANOGRAPHIC EXO4000 is still light on the wrist - although its diameter of 48 mm and its volume are substantial. In terms of brightness, the time and elapsed time measured by the flange must be legible from a distance of 25 cm in the dark. To meet this requirement, the dial, flange and hands of the Oceanographic have been optimised to have a larger surface area treated with SuperLuminovaTM, a luminescent material that emits a red color. The watch is fitted with two screw-down crowns (a protective measure that helps ensure water resistance by compression of an O-ring seal). The flange crown which sets the dive time is placed at the 2 o'clock position for easy access and more comfortable use. It is unidirectional, again for safety reasons, with a bayonet fitting, and protected by an oversized crown guard, for extra safety and easy operation when handling diving equipment. The second crown, for winding and setting the time and date, is positioned at 4 o'clock to avoid obstruction. Finally, the Oceanographic EXO4000 has a helium valve, a feature essential to any diving watch capable of descending to great depths. An essential feature when the watch is used in diving chambers, the helium valve allows gases that have infiltrated the watch during the descent to safely escape during the ascent. It is made from stainless steel, positioned at 10 o'clock, visible from the left-hand side lug. 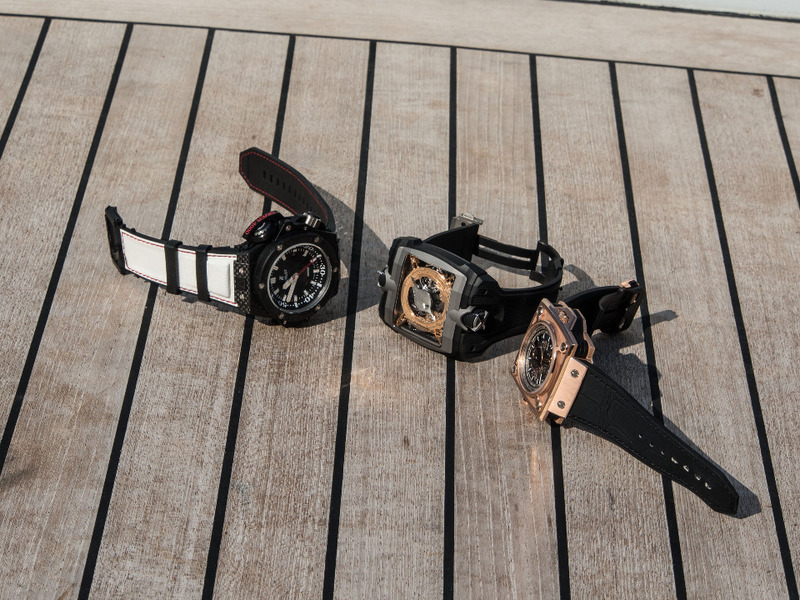 The watch comes with two tongue and buckle straps ("Town" & "Diver"). This type of fastening is more secure than a folding clasp for this type of use, and is also easier to handle and close when wearing diving gloves. 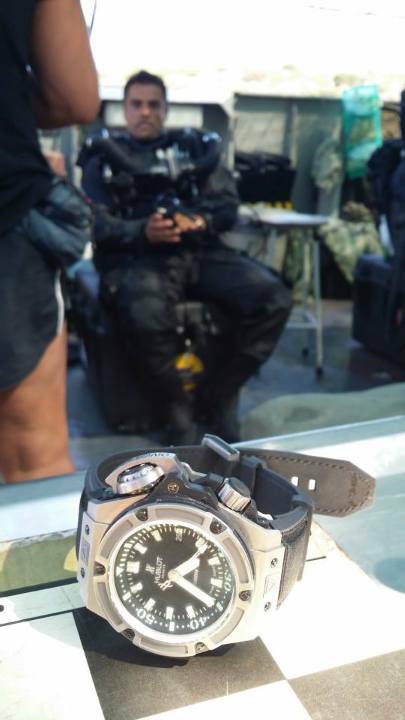 The "Diver" strap, a blend of rubber and nylon, longer than a standard strap, has been developed to be worn over a diving suit up to 8 mm thick. The length of the strap designed to be worn with the EXOSUIT is actually 50 cm! 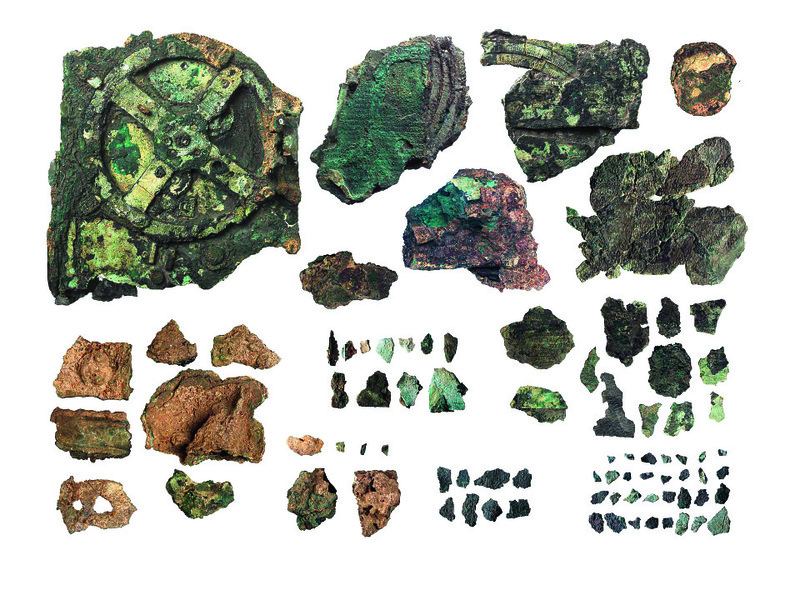 The Antikythera: 82 fragments which the X-ray scanner has revealed to include toothed wheels eaten away by corrosion and numerous gears invisible to the naked eye. The fragments of this "machine" were only analysed in-depth, taking a multidisciplinary approach, at the beginning of the 21st century. This work enabled the complexity of this extraordinary mechanism to be better understood. We now know that this "astronomical instrument" dates from the 2nd century BCE (between 150 and 100 BCE). Originally, it served as a "calculator"; its bronze gear trains were housed in a wooden box measuring approximately 33 cm x 18 cm and its case was sealed with two bronze plaques covered with inscriptions. Only 82 fragments of this "machine" still remain; some minuscule, all corroded: they are now forever protected in the National Archaeological Museum of Athens. A state-of-the-art tomography study (using an X-ray scanner) has provided images which can be used both scientifically and archaeologically, revealing numerous internal gear trains which are invisible to the naked eye, toothed wheels and new inscriptions hidden under the concretions: less than a quarter of the ancient Greek lettering of this text engraved on the "machine" has been successfully deciphered, but it is believed to be a sort of "instruction manual" for the mechanical calculator, also thought to show the movement of some major planets. The gears were driven by what is believed to be a side handwheel but the possibility of an auxiliary hydraulic system has not been ruled out. It is now accepted that this machine could have been designed in Rhodes, home to a community of astronomers including Hipparchus, as well as "mechanical engineers" such as Posidonios. A new hypothesis has been sketched out: this machine is probably closely linked to Syracuse, in Sicily, the city of the famous mathematical genius Archimedes, then a prosperous Corinthian colony. 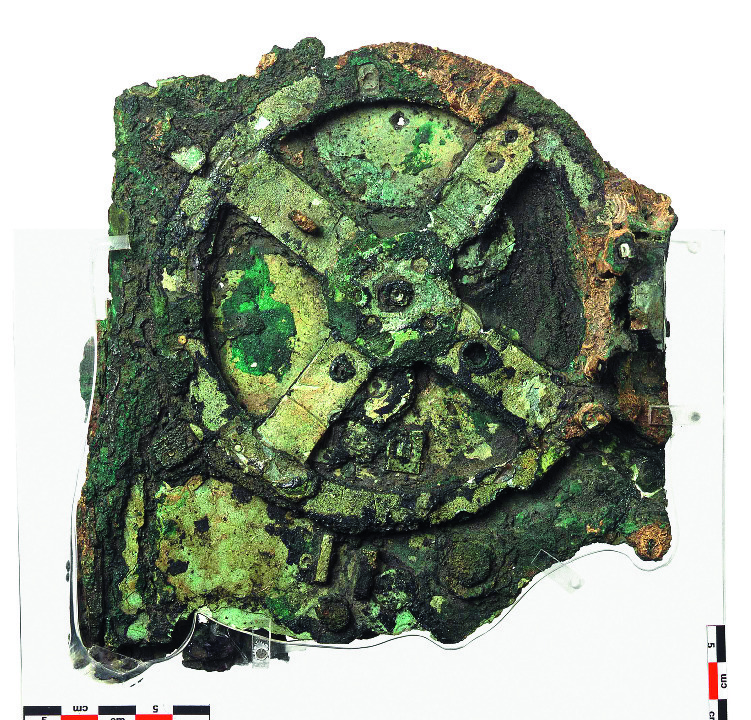 The Antikythera mechanism could have been designed there before its eventual shipwreck off the coast of the island whose name it came to bear. The study of the Antikythera mechanism only very recently begun is far from being finished, but it has given rise to a great wave of reinterpretation and reassessment of our knowledge of Antiquity. The reality of the mechanical knowledge held by these Greek scholars is a fantastic field to explore. It may even be that a record is found, in the texts or in the hidden reserves of museums, of other "machines" like the Antikythera mechanism. 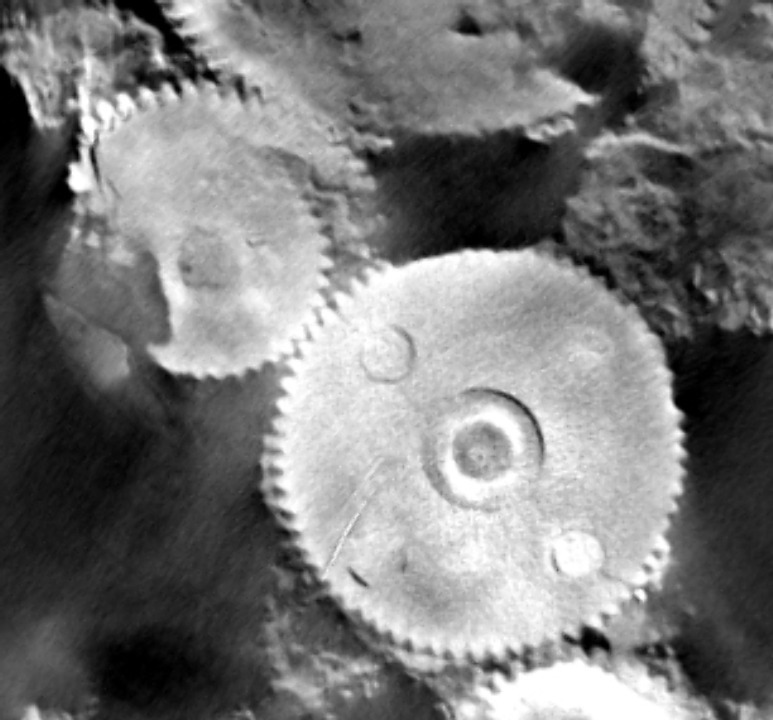 In 2008, the revelation by the scientific journal, Nature, of tomographic analyses performed on the fragments of the machine certainly fuelled the imagination of some less conservative watchmakers. 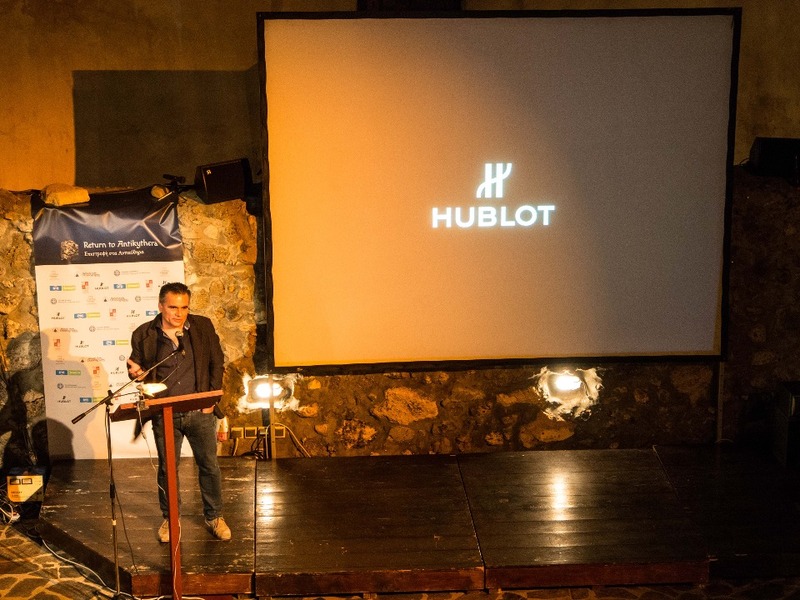 Mathias Buttet, current Director of R&D at the Hublot manufacture, wanted to pay homage to the historical legacy that this first mechanical masterpiece represents. A technical tribute and a miniature recreation of the entire Antikythera mechanism as revealed by scientific analysis, crafted to fit perfectly on the wrist. It is also a homage to watchmaking, as it adds a new dimension to this astronomical calculator: that of a timepiece in its own right, capable of accurately measuring the time. The watchmakers helped the archaeologists better understand some gear trains and confirm some hypotheses relating to the mechanics, while the scientists shared with the watchmakers technical solutions hitherto lost in Antiquity (in particular circular gears with non-linear cycles). 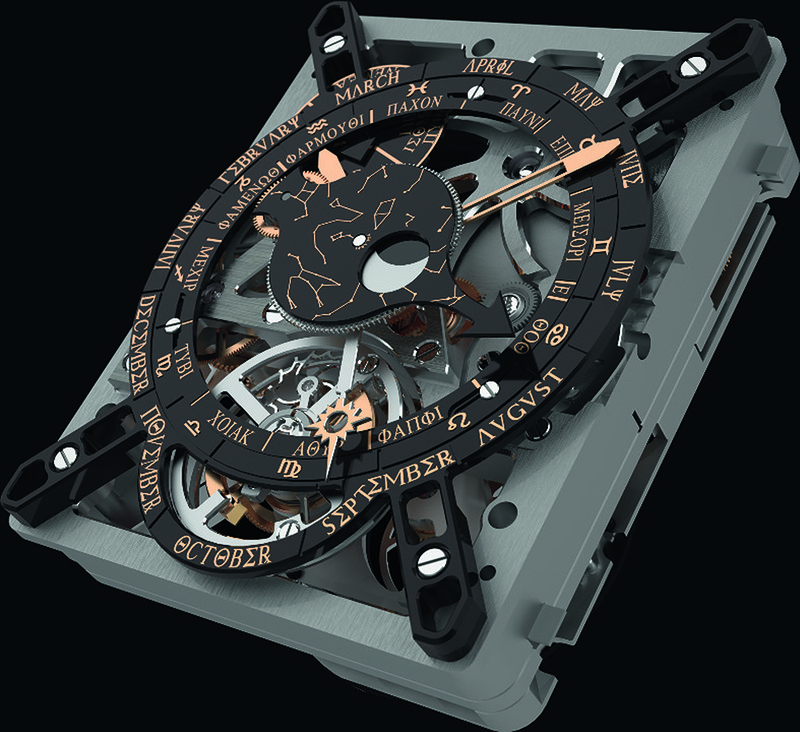 The challenge facing Mathias Buttet's team was to integrate a watchmaking movement in a miniaturised reinterpretation of the Antikythera mechanism, respecting the architecture of the original, and in particular its double-sided display. The team's first task was to create in a few cubic centimetres what the mechanical engineers of Antiquity had developed over several thousand cubic centimetres, ensuring their creation was perfectly in keeping with the spirit of the original mechanism, both in terms of its accuracy and the legibility of its indications. 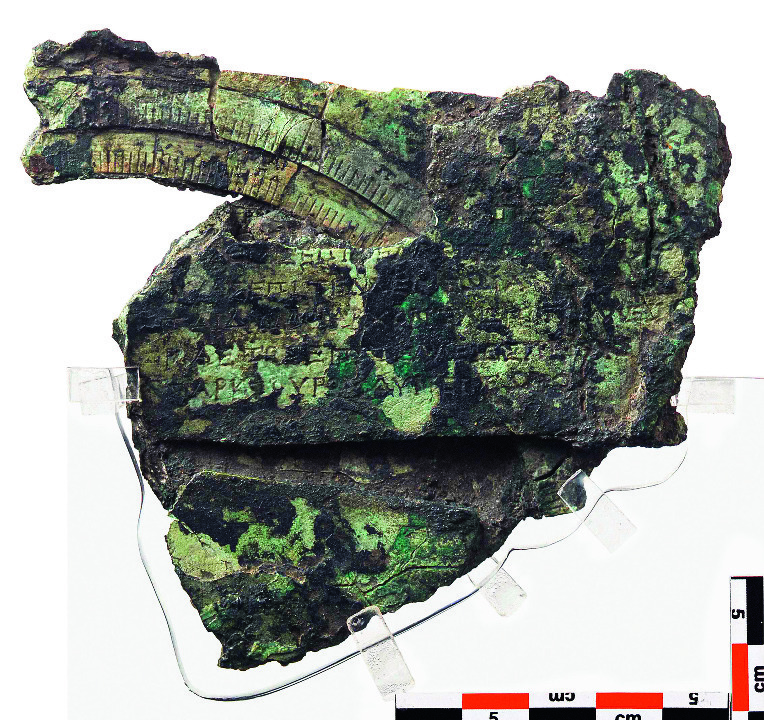 The various known indications of the Antikythera "machine" have been faithfully reproduced on its modern-day counterpart, both on the front and on the back. The primary face of the movement shows: the calendar for the Panhellenic games (which designated those cities hosting the games), the Egyptian calendar (12 months each of 30 days, with the epagomenal, or additional, days), the position of the sun in the constellations of the Zodiac, the phases of the Moon (with a magnificent hand and aperture which shows the position of the Moon in the zodiac throughout the synodic month), as well as the sidereal year. The back of the watchmaking movement shows the Callippic cycle, the Metonic cycle, the Saros cycle and the Exeligmos cycle. This is the first time in the history of timepieces that these cycles - a legacy from Antiquity have been studied, reproduced and displayed mechanically: to create some of these gears, the Hublot team had to develop a highly innovative concept of noncircular telescopic hands, capable of pointing to the spiral discs of varying diameters. 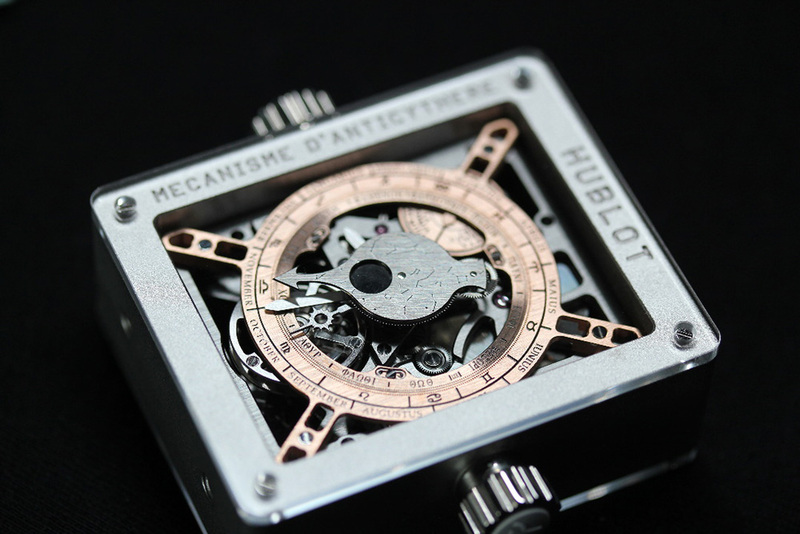 The Hublot "Antikythera" watch housing this watchmaking movement, a concept devised in Antiquity, was presented at the Baselworld watch show in Spring 2012.